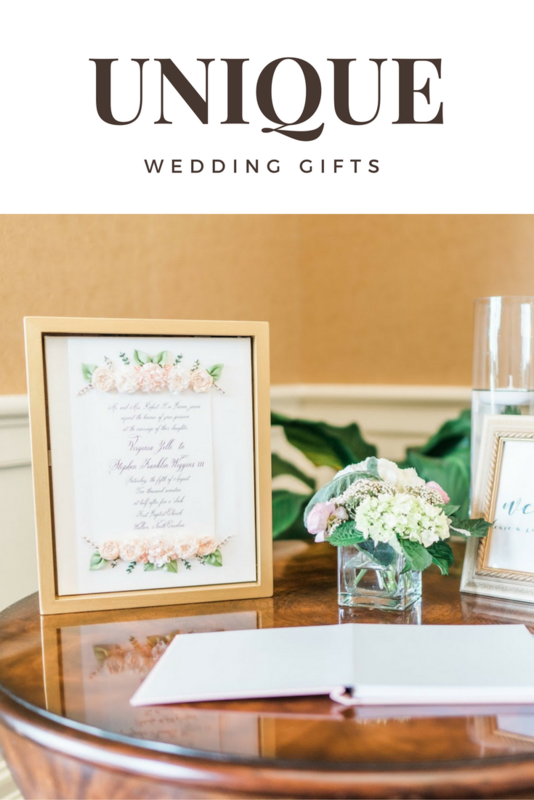 I'm often asked for ideas about what to give a happy couple for their wedding or what my favorite item that we received is. I will say that shopping off someone's registry is a sure-fire way to give someone exactly what they're looking for (they registered for it, after all! ), but if you're looking for a few personalized ideas, check out these ideas! How stunning is this?! Genevieve Hayes of Genevieve Hayes Gifts creates perfect and timeless gifts. She took my wedding invitation and used photos from my Pinterest inspiration to create a vision board of her concept for my piece. Genny hand-dyes each piece of silk she uses and embroiders a canvas that is complete with the wedding invitation (or other keepsake item). She also offers framing, so the gift is ready to give as soon as you receive it! Though I displayed mine at our wedding, it would also make a great gift for someone as a keepsake. Each piece is one of a kind creation and you work with Genny herself to create something perfect. I now have mine displayed on one of our console tables in our home. This piece of artwork was created by Brooke of Southern Bee Designs at the request of my bridesmaids, and it is one of my most treasured gifts. Each circle is representative of a special place in mine and Stephen's love story: Meredith College and the NC State bell tower, as that's where we were each in school when we met; the Charlotte city skyline, as we moved to that area after college (he to Matthews and I to Huntersville, and we had to drive through the city each time we saw each other and had a great time exploring a new place); the beach house and dock where Stephen proposed, the church and country club where we were married; and finally are first home together. I can't tell you how much I treasure this gift! 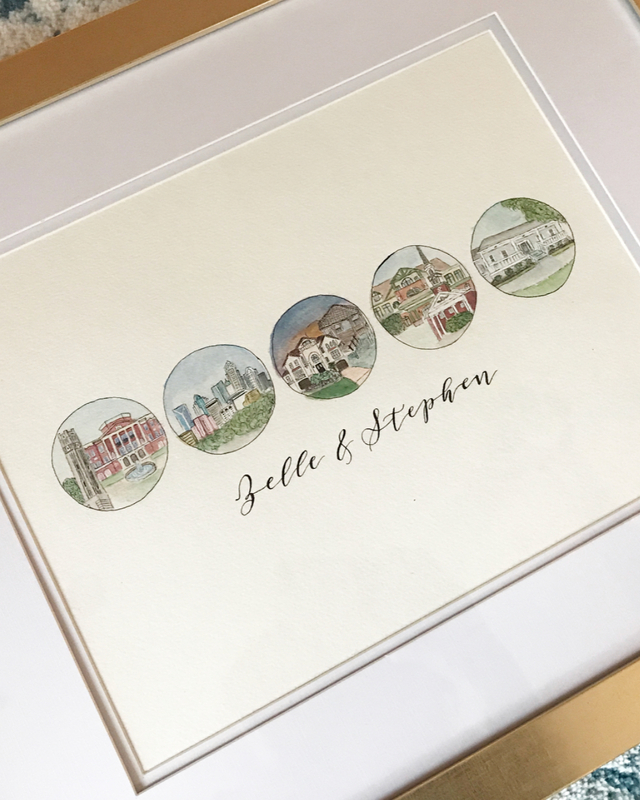 Another great gift option is a painting that is symbolic of the couple's relationship and/or marriage, like their wedding location! For my friend Hillary's wedding, the bridesmaids commissioned Allison of Alley Hunt Art to create a painting of her ceremony and wedding location. Many artists, like Alley, also do live paintings, so you could also gift the couple a live painting session of their ceremony. What are your favorite gifts to give for a wedding? What was the best wedding gift you received?